A paper bag in the shape of Easter bunny. 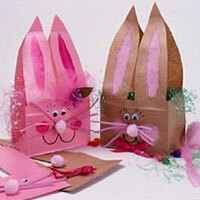 Make this easy to make cool Easter craft for the occasion. Cut a V notch at the top of each lunch sack. * Hint: Draw the V from the top opening of the sack with a pencil. Start at the top center and bring your notch down. This will form the ears. Close the bag and lie flat. Then cut your notch with both sides of the bag together. This will be the bunny ears. Cut out ear shapes with the white construction paper and glue onto "ear" of the bag. Cut a smaller piece in pink for the inside of the ear, or reverse the colors. It's your choice. Cut out a small triangle of pink for the nose and paste it in the center where a nose would go. Draw in your eyes or you could cut them from paper or even add wiggle eyes. Cut out a rectangle piece of black paper. Small in size about mustache size. Then make cuts from each side of the short end towards the center of the paper without cutting all the way through. Do this several times on each side to create whiskers. Paste this above the nose. Now draw two circle cheeks and connect the mouth from the cheeks to the nose like a kitty mouth. Open up bag and it can now be a bag to collect eggs from your class egg hunt or to take crafts home in and then use for center piece at home!